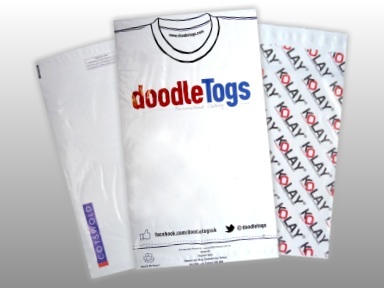 Boost your company branding with your own personalised printed mailing bags. The ideal partner to printed carrier bags for a total branding solution! 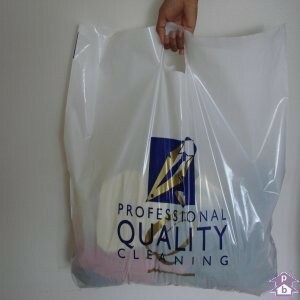 Get a quote for printing any logo or design on your Mailing Bags in just 60 seconds. It's that quick and easy! Give your laundry or dry cleaning service that touch of added professionalism with your very own printed laundry bags, complete with your company branding! If you need carrier bags but don't need your own design on them, then take a look at this extensive range of carriers available off-the-shelf, from cheap and cheerful vest carriers to luxury shopping bags. Discount Printed Carrier Bags is a specialist website from Polybags Ltd, the UK's number one manufacturer of polythene packaging, to highlight their provision of printed carrier bags at heavily discounted prices. Polybags specialises in producing first class polythene products at competitive prices with high and low print-runs. Because Polybags is a manufacturer we can always offer direct wholesale prices cutting out the markup that other merchants have to apply. Orders placed with Discount Printed Carrier Bags are fulfilled directly by Polybags' first class service team with no commission or additional costs added. 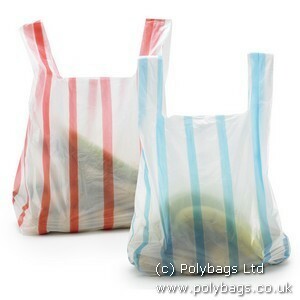 Polybags stocks polythene, paper and biodegradable carriers in all shapes and sizes. With patch handle carriers, vest style carriers, varigauge carriers, fashion carriers and more, there is a carrier bag to suit any purpose and budget. Mailing bags are lightweight, strong and waterproof, making them perfect for regular post or courier deliveries. Order your own printed mailing bags with your own personalised design, or choose from a range of bags to suit your needs. For air-cushioned protection for delicate or valuable items in storage or transit, Polybags' range of bubble wrap and bubble bags will have you covered. Available in a range of sheet widths and bag sizes to suit the product you need to protect, whilst bubble-lined or featherpost mailing bags are tailor-made for protecting items in the post. Polybags stock a huge range of eco-friendly packaging to help you with a wide range of tasks whilst looking out for the environment. All designed in line with the latest research, you can choose from biodegradable carriers, mailers and clear bags, along with eco-friendly bin liners, specialist eco-packaging and more. A range of garment bags and covers designed to protect clothes in storage or transit. Includes duvet and linen covers and dry cleaning bags, available in clear or pre-printed form to suit your product needs and budget. Keep small to medium-sized items dry and sealed away from contamination with this range of grip seal bags. Just squeeze the plastic seal to shut these bags, available in clear or coloured polythene. When you need to wrap items of all different sizes and shapes, then polythene bags aren't ideal for the job. Instead, use polythene sheeting or layflat tubing to use just the right amount of polythene to cover your product and then seal. Extend the shelf life of food by to five times with vacuum bags - a favourite of the catering industry and ideal for a range of fresh produce, from meat to fish and cooked to dried foods. Compatible with all major chamber vacuum sealers. Crystal clear display bags made from high clarity polypropylene film really help retailers and manufacturers to show off their products. Add a touch of sparkle to your displays! A firm favourite with food retailers across the country, Polybags' range of produce and paper bags includes paper bags, shop counter polythene sheets, ultra-high density film bags and take away carriers. Polybags caters for waste disposal needs in the home, office, garden, building site with this huge range of bin bags and sacks. Includes clinical waste, asbestos and other specialist waste sacks. If you need to pack items away and want to offer them some protection then look no further than Polybags' extensive range of packing bags. From tiny electronic components to large pieces of furniture, this range of polythene packaging has the size, shape and thickness you need to protect your items in storage or transit. Any retailer looking to make an instant and lasting impression with customers should order bespoke packaging containing your very own design, including company name, logo, colour scheme or advertising slogan. Printed carrier bags and printed mailing bags are Polybags' most popular bespoke ranges, but other products can be personalised to suit your needs.